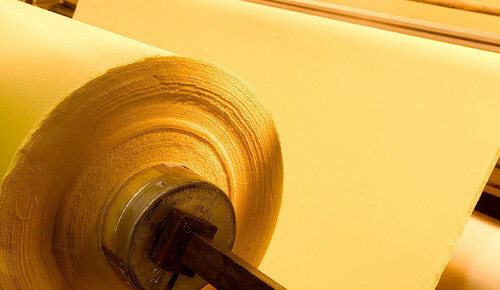 Warwick uses Kevlar® fiber from DuPont to enhance the performance of many of our products. Kevlar® is a key component in many TurtleSkin protective fabrics. TurtleSkin Gloves are used to protect hands from cuts and needlesticks while remaining lightweight and comfortable. TurtleSkin WaterArmor is used to protect UHP (Ultra High Pressure) water blasters from injuries. TurtleSkin protective materials can be used to provide advanced protection in many applications, including aerospace and military. "Kevlar® is an advanced technology that helps transform the ordinary to the extraordinary. It combines high strength with light weight, and comfort with protection. Products made with Kevlar® brand fiber help those who use them to do more, to go farther, to be even better at what they do. Whether it's working in a plant, at a construction site or in a forest. Whether it's walking a beat, escorting a prisoner to his cell, or completing a tour of duty. Whether it's winning America's Cup, the Tour de France, or the Boston Marathon. Whether it's protection from the hazards they face on the job every day, or the comfort and lightweight strength they rely on to help them achieve their personal best, men and women around the world rely on one brand — Kevlar® — to help them realize the Power of Performance."